Glasses can help you to hone your signature look (two words: Jenna Lyons), but for many of us, shopping for new frames is always an ordeal—it can be hard to find a pair that you like after you've left your optician's office. Personally, I am a reluctant glasses wearer—I have yet to find a pair that I'd be happy to wear with a summer dress or that I don't quickly remove to have my picture taken. But seeing as squinting isn't a good look, I've turned to the stylish glasses-wearers I know for the ultimate guide to finding frames you'll love and want to wear. Scroll below for your key commandments for finding a pair of glasses you'll love when you leave the optician. Alex Stedman of The Frugality wearing her glasses. Model Joanna Halpin wearing one of Hannah's favourite new eyewear brands, Ace & Tate. You might be tempted to head straight to Prada, and while that's no bad thing, there are also some under-the-radar brands worth discovering too. "I think having access to so many brands helped me on my journey," adds Hannah. "It can feel depressing at first, but once you start exploring your options, it's a growing industry with pockets of interesting start-ups as well as the über-brands diversifying. I enjoyed the process of Ace & Tate's affordable try-before-you-buy delivery service that you can set up online. For me, it's more worthwhile to buy wisely in the eyewear department than an investment handbag—the sheer cost per wear proves it." ASOS Lesley wearing her geek glasses. Jan-Michael Quammie wearing her statement cat-eye glasses. Street style star Jan-Michael Quammie doesn't need prescription lenses, but she often wears clear frames by Céline, Ray-Ban, Karen Walker and Andy Wolf. She tells me that she loves statement glasses to "punch up a boring outfit," but she uses them more as a "protective barrier," explaining "glasses, for me, are another protective layer, and I feel my face is less exposed when I'm wearing glasses a lot." Jan-Michael prefers to wear cat-eye frames, and she says of finding frames to suit you: "If you have a round face, do a square frame, for longer faces, a cat eye is really flattering, and for anyone who has a small, sharp-featured face, I love the tiny round lenses. But the main rule I go by is that the glasses mustn't be smaller or narrower than your face—so the frames should come out a little bit wider than your face." 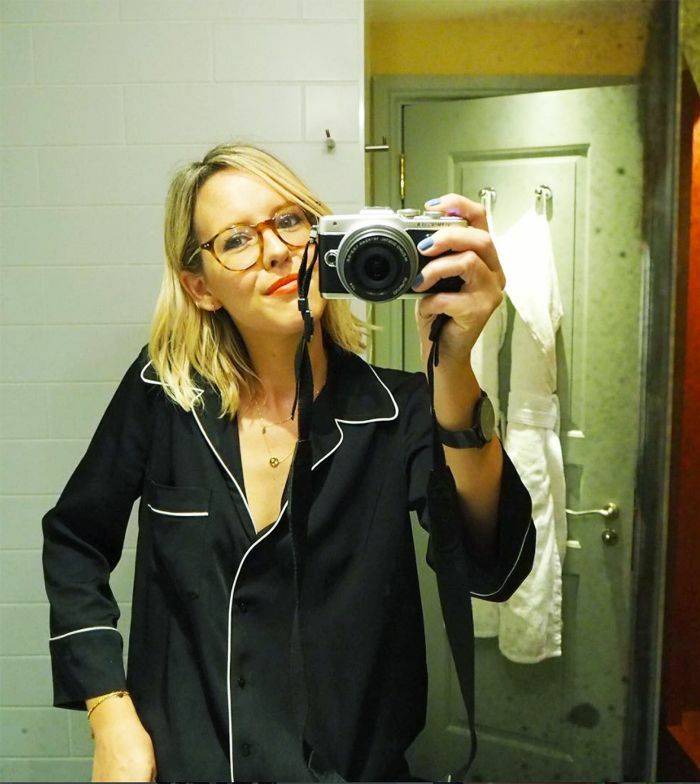 Byrdie's Amy Lawrenson wearing her oversize glasses. Byrdie UK editorial director Amy Lawrenson warns me of the downside of just following trends: "I bought a pair a few years ago and never wore them. The frames were dark, which I always thought I liked, but in reality, they overtook my face. My new frames are basically what's on trend now—geek glasses—but even when they go out of fashion, I'll still be wearing them. I've had so many compliments and people have said looking at me in these they feel I should have been wearing glasses all along. I've always gone by what's on trend, and it just so happens this pair now are the fashion, but I think when finding glasses, you need to remove yourself from that and look at what truly suits you. Think about what metal or acrylic colour suits your skin tone, and what shape looks best on your face." Fashion blogger Doina wearing her Gucci geek glasses. You can feel pressured to make a decision as soon as you've had your eye test, but it pays to take your time and really think about it. "I think go alone first, but then take a couple of people you trust with you to offer a second opinion," advises Amy. "Think about it: You go through all that when shopping for a wedding dress you will wear for maybe 12 hours, glasses you will likely wear every day." Elle Fanning wearing her Warby Parker glasses. Caren Downie, founder of new eyewear brand Byocular.com, tells me that colour is actually more important than silhouette. "Finding the perfect colour is the most important thing; then do you want to make a style statement or want them to blend in to your overall look," she explains. "People often dismiss a shape because the colour doesn’t suit them, I can wear all the Byocular shapes depending on what colour they are." Who What Wear's Nell Block wearing her statement glasses. When it comes to glasses, people tend to have a lot of opinions about what works and doesn't work for you, but sometimes you should just ignore all that noise and go with what you want to wear. "Sure, there are plenty of people who will tell you what glasses suit your face shape better, but quite honestly they don't have to live with the style," Elinor Block, assistant editor at WWW UK, tells me. "My most recent glasses were not the optician's favourites, but I went with them, and I'm pleased I did." Jan-Quammie Michael wearing her statement glasses. Jan-Michael believes that even if you use glasses as a fashion statement, you should still invest in good-quality frames. "There's a certain way you can wear fashion glasses," she explains. "If they are plastic and cheap, I wouldn't do it because they aren't great for your eyes—Ray-Ban does special lenses for people who don't need glasses, and the lenses protect your eyes." For more styling tips, see our guide to how to wear black in summer.